New Delhi, Sep 27 (IANS) Prime Minister Narendra Modi on Thursday expressed his gratitude to the global community for conferring upon him the United Nations (UN)'s "Champions of the Earth" award and dedicated it to the countrymen and the country's tradition of coexisting with nature. "I would like to express my gratitude to the global community for conferring this honour upon me. This honour is not meant for an individual, but rather for the great Indian tradition, through which for centuries, we have been taught values like co-exisiting with nature," Modi said in a video message. He said he was delighted that "the human race has begun to accept the importance of nature". "This struggle with nature has brought destruction, both on humankind as well as on nature. In this changing situation, all of us are putting emphasis on protecting nature," he said. The Prime Minister's remarks came after the United Nations recognised him with its highest environmental honour in the Policy Leadership category. Modi and French President Emmanuel Macron were recognized in the Policy Leadership category for their pioneering work in championing the International Solar Alliance and promoting new areas of levels of cooperation on environmental action, including Macron's work on the Global Pact for the Environment and Modi's unprecedented pledge to eliminate all single-use plastic in India by 2022. Modi said: "Whether you call it global warming, or whether you call it environment, or whether you call it carbon emissions, whether you are referring to "developed countries" or "developing countries", no matter what phrase you use, ultimately we must all focus on climate justice." Asserting that the poor and the marginalised were the ultimate victims of the climate injustice, Modi said "we need to put the same emphasis on protecting nature as we do on other issues". He also said that in the pursuit of climate change, "India stands with the world, and is ready to march with you, shoulder to shoulder in order to achieve this goal". Beside Modi and Macron, Kerala's Cochin International Airport was also honoured for its entrepreneurial vision, for its leadership in the use of sustainable energy. 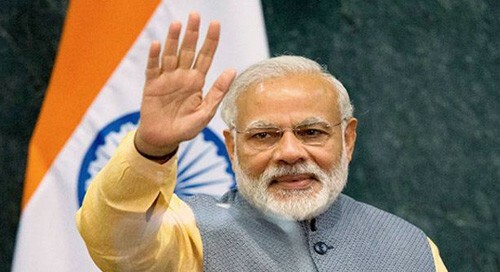 "Delighted that Cochin International Airport's remarkable usage of sustainable energy has been recognised and the Airport is a proud recipient of the UN ‘Champions of the Earth' awards," Modi tweeted. "The Airport is an inspiration for several other airports in how we can leverage the power of solar energy for a better tomorrow," he added. The UN Champions of the Earth awards would be presented during the Champions of the Earth Gala in US' New York City, on the sidelines of the 73rd UN General Assembly (UNGA).